In a piece for The Atlantic published on March 10, Chicago mayor Rahm Emanuel admonished Democrats to dial back their pro-socialist rhetoric, his rationale being that their vociferous advocacy for socialism in recent months has the potential to spook the American electorate, driving voters into the camp of President Donald Trump and ensuring his re-election in 2020. Emanuel definitely has a salient point in this argument, inasmuch as Trump’s election in 2016 was a mandate against the hard left policies of the Obama administration in the first place. It is easy to understand the urgency on the part of Democratic power players to re-claim their political ground; the irony lies in their manifest inability to see that this urgency is driving their overreach (and counter-intuitively bringing about what they don’t want, if Emanuel is correct in his reasoning). Still, why would Emanuel, a hardened leftist elite, a political ninja and one of the most evil men ever to grace American politics, seek to stifle pro-socialist rhetoric considering he has been one of the most influential Democrat power players out there? Well, it’s precisely because he is such an adept politician. Emanuel is reportedly stepping down after two terms as mayor of Chicago, but his career boasts his having been a key operative in Bill Clinton’s administration and chief of staff under Barack Obama from 2009 to 2010. Many argued that his early departure from the Obama White House (along with several other cabinet-level appointees) was an act of self-preservation born out of his knowledge that Obama was going to push the envelope dangerously far politically, and that a less prominent but secure and lucrative position—such as mayor of Chicago—might suit him better than federal prison. It is likely that Rahm Emanuel was responsible for the ouster of Obama’s Green Jobs Czar Van Jones in September of 2009. Jones, a long-time Obama cohort and family friend, had been a little too vocal about his communist leanings and telegraphing White House policy; Jones even stooped to calling Republicans “assholes” publicly. It is just this sort of honesty on the part of more radical Democrat operatives that Emanuel knew would not play well with the American people. For decades, communists and others on the far left have known and stated that since America was the wealthiest nation on the planet, the ascendency of leftists in government would have to be handled delicately; in other words, they knew that their operatives would have to misrepresent themselves in order to gain acceptance by the electorate. This is why we have people like Barack Obama marketing themselves as moderate Democrats when they’re running for office, and double agents like Michael Bloomberg bearing an “R” after their names. 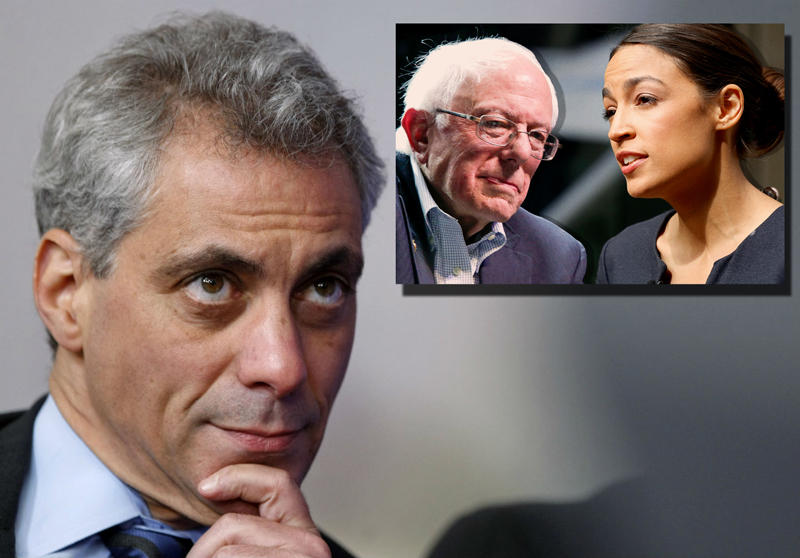 Though there’s little doubt that the oratory of Bernie Sanders and Alexandria Ocasio-Cortez warms the cockles of his skeevy little heart, Rahm Emanuel knows what so many of his political opponents and detractors know: that a majority of the American people do not embrace socialism, and that consequently, any strategy must be one that facilitates their one day “waking up” to a socialist America—long past the point where this outcome could have been prevented. We can recall how carefully measured most of Barack Obama’s rhetoric was during his presidency, even if the content was inflammatory or divisive. Emanuel (and therefore, the Obama White House in 2009) knew that Obama’s “fundamental transformation” of America could absolutely not be construed by the electorate as amounting to socialist ascendency. Emanuel is probably as aware as anyone reading this that realization on the part of voters that this was in fact the case is why Donald Trump occupies the White House today. As recently pointed out by Fox News’ Howard Kurtz, Emanuel also knows that policies currently being touted by some of its presidential contenders and younger members—reparations for slavery, the Green New Deal, Medicare for All, free college tuition and a 70% tax rate on high earners—are extremely unpopular, and that Democrats don’t yet have the numbers to aggressively support such measures without terrifying informed voters and those who are still stinging from the economic turbulence of the last twelve years. While the Democratic Party—and progressives in general—tend to do a lot better in maintaining cohesiveness within their base than the GOP, the warnings of those inside and outside the party that far left Democrat operatives may be trying to go “too far too fast” are quite astute, and do evidence political wisdom. Just don’t tell Bernie Sanders and Alexandria Ocasio-Cortez. Too many Americans have yet to see past the sugar-coating progressives have put on socialism in recent years, so the more terrified they are of it, so much the better.